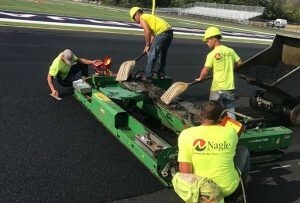 EAST SYRACUSE, NEW YORK – SportGroup is pleased to announce the acquisition of Nagle Athletic Surfaces, Inc., a prominent track and outdoor court installation specialist based in East Syracuse, NY. Nagle joins the SportGroup family of companies, which includes AstroTurf, APT – Advanced Polymer Technology, Polytan, SYNLawn, Melos, and more. The sale was finalized on July 31, 2018. The Nagle acquisition marks a significant investment in the Rekortan and Laykold brands and commitment to the track and outdoor court industry. As a premier installer of athletic surfaces with over 100 years of combined management experience, including two inhouse ASBA-Certified Track Builders, institutions across the northeast trust and rely on Nagle as a valued partner. Visit Nagle’s website at www.nagleathletic.com to learn more.